Tax avoidance by companies cost EU countries €160-190 billion in lost revenue a year. MEPs will discuss new measures to fight the most common practices on Tuesday 7 June and vote on them the following day. Read more about the legislation and check our infographic that shows corporate tax rates and respective tax income by member state. The directive that has been proposed by the European Commission is based on the principle that taxes should be paid where profits are made. The plans contain six key measures to fight aggressive tax planning and also sets out common definitions of terms such as permanent establishment, tax havens and minimum economic substance. The issue with current legislation is that these terms have been open to interpretation. The Commission proposed the directive in response to the OECD’s action plan to tackle base erosion and profit shifting. Parliament is being asked to give its opinion on the draft legislation, although the decision will be taken by the Council, which represents EU countries. Parliament is keen to curb internal lending, which is one of the most common ways for companies to show low profits and avoid paying tax. To tackle this MEPs advocate stricter limits on the deduction of interest payments, which to some extent is the corporate equivalent of the mortgage interest that home owners can deduct from their annual taxable income. 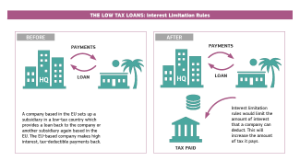 Multinationals make use of it in the following way: a group based in the EU sets up a subsidiary in a low-tax jurisdiction and the subsidiary then provides it with a loan that comes with ‘inflated’ interest rates. This means that the EU-based company has to pay large sums of interests. These interest payments can usually be deducted from the taxable income. After paying the interests, the EU-based company has little or no profit left, meaning lower or no taxes have to be paid and the money remains with the group. EU wants to limit the amount of interest payments that the taxpayer is entitled to deduct in a tax year in order to increase the amount of paid tax. The Commission proposes that companies should not be allowed to deduct more than 30% of their earnings. MEPs say this should be limited to 20% or €2 million, whichever is higher. The infographic shows the maximum corporate tax rates in EU countries as well as much tax they collect from companies and the respective contribution to the gross domestic product.